WOULD you like to have a character in a book named after you? Well, now’s your chance! One lucky person gets to choose a name that I will then use for one of the characters in the forthcoming sequel to Mr. Gunn & Dr. Bohemia. You can choose your own name, or a family member, or a friend . . . the choice will be yours—well, within reason; I’ll get to that shortly. 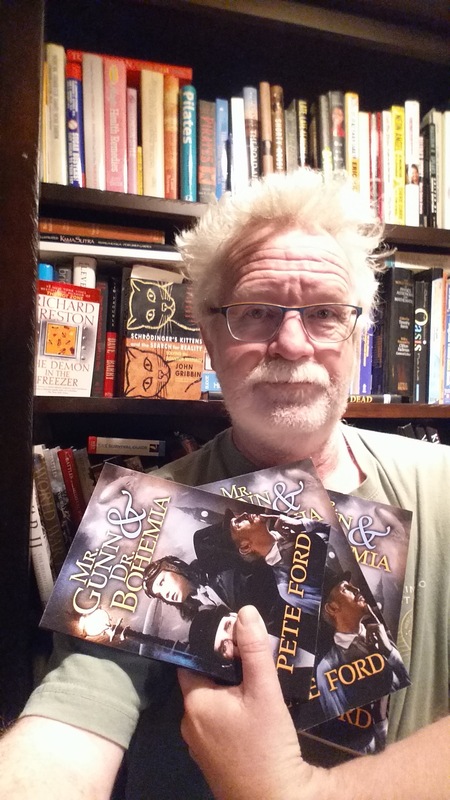 First, get hold of a copy of Mr. Gunn & Dr. Bohemia in the format of your choice. See this page for a list of stockists. Post a review on the Amazon page here. The review must be at least 100 words, but the content is all yours, and you can be honest—in fact I’d prefer it. If you think the book’s only worth a one-star rating and you really didn’t like it, say so. Giving a glowing review and a five-star rating won’t change your chances of winning the competition. The name you’d like me to use for a character in the book. As I mentioned, it can be your own name, or that of a friend or family member, etc. However, it must be appropriate for a nineteenth-century person (if you’re using a real name, that shouldn’t be a problem). I can’t use Twitter handles like BuzzGrrl999, for example. And please don’t use famous names; I can’t really have a character called Mitt Romney or Barack Obama or Kim Kardashian. I’ll be the final arbiter on whether I can use the name. A link to the Amazon review you’ve created. I need enough information to be able to find it, so a URL is probably best. A contact email address, in case I need to get in touch. I will not share this email address. The winner will be announced on this blog on July 1, 2014. I will choose the character that gets the name based on how the name fits. For example, if the name you choose is German-sounding (or at least fits a German character), then I might attach it to a German secret agent. So bear in mind your character might not necessarily be one of the good guys. And your character might end up dying a nasty death. But hey, that’s actually a pretty cool thing to tell your friends, right? You’ll also get a mention in the acknowledgements at the end of the book. That’s all! Read it, write a review, let me know. What are you waiting for?